Congratulations! What a cute card! Perfect for 10 million! congratulations to this big big milestone! Nice postcard, congratulations to both of you! Happy Postcrossing! And what a great card to win the contest!!!! 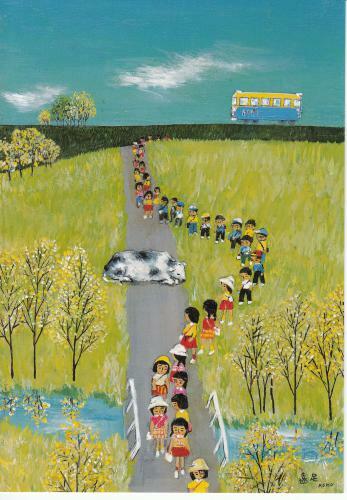 and all these people on a path... what a great card to celebrate postcrossing. Congratulations to both of you, Yvonne and Yoko! I think thats a wonderfully appropriate 10,000,000th card. Lovely. This is a very special card! Congratulations! Such a lovely card!!!! Congrats!!!!!!!!!! Im already waiting for the 20 milions postcard!!! CONGRATULATIONS to all the Postcrossing family!!!!!! Wow! I did actually receive a postcard from this user from Japan!!! Amazing! I know her!!!! the 10 million beautiful card! congratulations from Portugal! The 10 millionth card!!! Must be brilliant to have sent/received it! We all made it to reach number 10 million! Congrats! Postcart # 10 million! Waw! All the best wishes from Brazil! Herzlichen Glückwunsch! Das ist soo cool!! Viel Spaß weiterhin! Congratulations! What a cute postcard! Fantastic card. Well done to sender and receiver. cHeeRs to tHe FiRsT TeN MiLLiOn!!!!! 10000000...that make this a very special card!!! Joepie!!!! Hoeiiii!! Hieperdepiep!! Van Harte!! Gefeliciteerd!! Super!! Congrats!! Parabéns aos dois e a todos os outros postcrossers que tornaram possível esta marca. 10.000.000 de postais é obra! Congratulations to all of us who made this possible! Fantastic! I am glad the 10 millionth card is so cute! A milestone and a nice card by the way. What a beauty this 10 mln nd card. Congrats to the sender and the receiver! Congratulations!!! Thanks to Paulo. Great project! Thanks to all Postcrossing members! This card very funny ^___^ congrats!!!!!! Great card! Congratulations to both the sender and the receiver of this milestone postcard! I love Postcrossing and all the wonderful connections I have made through this site! Absolutely amazing! Congratulations from Brazil!!! For both: beautiful card and 10.000.000 card!!!!! Such a lovely card! Can you imagine? 10 000 postcards just for fun??!! Happy to be among all the postcrossers who have made it possible! Keep on crossing! Adding my congratulations to both sender and receiver. What a delightful card for such a great milestone! Can you imagine that the receiver or sender that posted the card gets the email: It's a favorite :-) Wow that many likes and comments, congratulations!! very nice, I love it, congratulations! Thank you for the many messages of congratulations. I was surprised to wake up. I'm glad to send a card numbered 10 million. I look forward to cards of 20 million! Love to all Postcrossing family!! Congratulations! Such a sweet card!!!! Congratulations and that's a nice postcard too! What a perfect card to be number ten million! Wonderful! Congratulations, Yoko, on being the person to send the 10,000,000th postcrossing card! I hope this brings you luck! Yoko and Yvonne, Congratulations ladies. You are 2 in 10 million. See, folks, it's important to always send a great card. You never know when it'll be a special one. Oh, that's right. It's always a special card when it arrives. Congratulations to all my fellow Postcrossers on 10 million! Such an appropriate card for number 10 Million. Love it! Gives you a warm feeling inside. Nice postcard -- full of meaning for celebration ^^! Thats a very beautiful 10 millionth card ;-) Congrats!! what a wonderful card!so cute so nice! Congratulations!!!!!! postcard number 10,000,000 !!! the 10.000.000! wow, so great! Happy postcrossing all over the world! A great idea! This has brought much joy to my life. Congratulations! It's a lovely card. Gongrats! And what a nice postcard! Congratulations guys! this card is perfect to be a 10,000,000th! eine wunderbare karte und steht stellvertretend für all die postcrosser die dieses projekt ermöglichen! It's amazing to start the day of my 10th birthday with the great 10 mln news! SVEIKINIMAI IŠ LIETUVOS! Congratulation! What a lovely card. what a nice card to be the 10th million! Congratulations !!! Happy Postcrossing, one and all! What a milestone! And such a beautiful card to celebrate!!! Congratulations to both of you! This is a superb card! xoxoxo Happy this one was the 10th million xoxooxxo blessings to all in our Postcrossing Family xoxoox write on!!! "Post Card Gal"
congratulations with your 10.000.000 card! It's a very pretty one too! Congratulations! What a cute card! Perfect for 10 million! Congratulations!!! Congratulations! The perfect card to be the 10th million! Happy Postcrossing! Wow - what a really nice postcard!!!!! Congratulations from Holland!! Happy Postcrossing! Congratulations and what a nice card! It's great that this one became nr. 1.000.000! Congrats! What an awesome card! Wow! Lucky you! :) Congratulations! What a beautiful card! Congratulation to everybody here for making it possible that the 10.000.000th card was sent and received! Wauw! 10.000.000 postcards from en too all the Postcrossers. Congratulations! Congratulations! Today is our holiday! What a nice postcard to win with! Congratulations you two! Gefeliciteerd! What a lovely postcard! Congratulazioni!!! Congrats! I have to agree: it is a wonderful postcard and I'm really glad that this is *the one*. A very nice postcard. Congratulation!!! 10 million cards = 10 million smiles!!! amazing postcard, amazing number ! Congratulations to the lucky draw ! I wish much,much beautiful cards from all the World! You are so lucky!!!! Congratulations! It's a fantastic card,I love it,Congrats!! It's the most famous card on huge Postcrossing! 717 faves! so much comments! Congratulations. I love this beautiful card. Congrats for being the 10000000 registered postcard! Parabéns from Portugal! What a happy number 10.000.000!!!! So happy about 10.000.000 signs of friendship all over the world! Congratulation!!!!!! !the postcard is so beutiful!!!! Congratulations to the sender and the recipient. It looks like a winderful Postcard to represent the Ten Million!! Сongratulation!!! And the card is well suited to this event! It's such a lovely card! congrats! Классная открытка! Такая милая, достойна звания ДЕСЯТИМИЛЛИОННОЙ! A great 10,000,000th card! It's representative of our huge great postcrossing community! It is just so so amazing! What a honnor to be the 10.000.000th one! Let's all busily write for the next 10 millions of cards! I feel glad that a postcard from Japan became the memorable postcard. Congratulations!From Siberia!! !How much joy brings a simple card! Congratulations! Congratulations!Congratulations from all of my soul! What a wonderful postcard :) Congratulations from Ukraine! Such a cute card! Congrats! It was meant to be! What a perfectly peaceful image to mark this milestone. Thank you to the founders for bringing joy to so many lives through your efforts. Thanks to all of the "old-fashioned" souls who share a common interest in the "Art of Letters." Also congratulations from the Maria in the Netherlands, happy postcrossing!